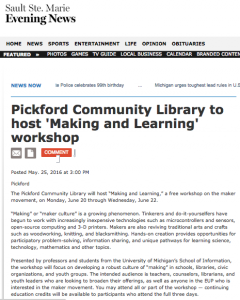 Pickford event featured in Sault Ste. Marie Evening News! 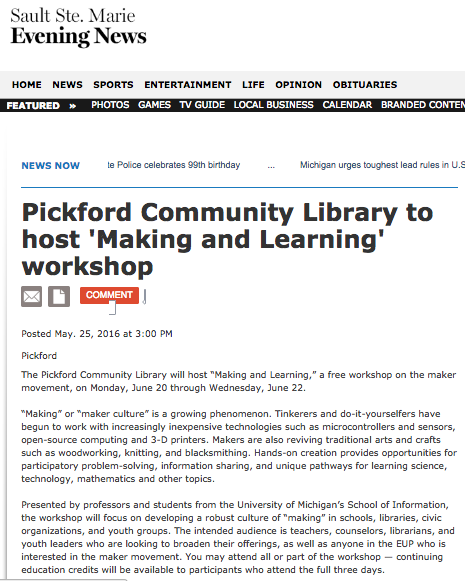 Thanks to the intrepid efforts of Ann Marie Smith of the Pickford Community Library, our upcoming three-day workshop there was written up in the Sault Ste. Marie Evening News! 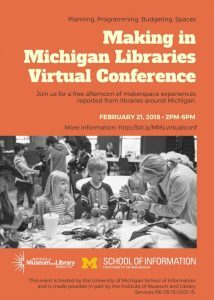 To register for the June 20 – 22 Pickford workshop or any of our other workshops, or to learn about our eight free, family-friendly MakerFest events around the state of Michigan this summer, please click here.